In Aztec mythology, Itzpapalotl (“Clawed Butterfly” or “Obsidian Butterfly”) was a fearsome skeletal warrior goddess, who ruled over the paradise world of Tamoanchan, the paradise of victims of infant mortality and place identified where humans were created. She is the mother of Mixcoatl and is particularly associated with the moth Rothschildia orizaba from the family Saturniidae. Some of her associations include birds and fire. Her nahualli was a deer. Itzpapalotl’s name can either mean “obsidian butterfly” or “clawed butterfly”, the latter meaning seems most likely. It’s quite possible that clawed butterfly refers to the bat and in some instances Itzpapalotl is depicted with bat wings. However, she can also appear with clear butterfly or eagle attributes. Her wings are obsidian or tecpatl (flint) knife tipped. (In the Manuscript of 1558, Itzpapalotl is described as having “blossomed into the white flint, and they took the white and wrapped it in a bundle.”) She could appear in the form of a beautiful, seductive woman or terrible goddess with a skeletal head and butterfly wings supplied with stone blades. Although the identity remains inconclusive, the Zapotec deity named Goddess 2J by Alfonso Caso and Ignacio Bernal may be a Classic Zapotec form of Itzpapalotl. In many instances Goddess 2J, whose image is found on ceramic urns, is identified with bats. “In folklore, bats are sometimes called “black butterflies””. Itzpapalotl is the patron of the day Cozcuauhtli and Trecena 1 House in the Aztec calendar. The Trecena 1 House is one of the five western trecena dates dedicated to the cihuateteo, or women who had died in childbirth. 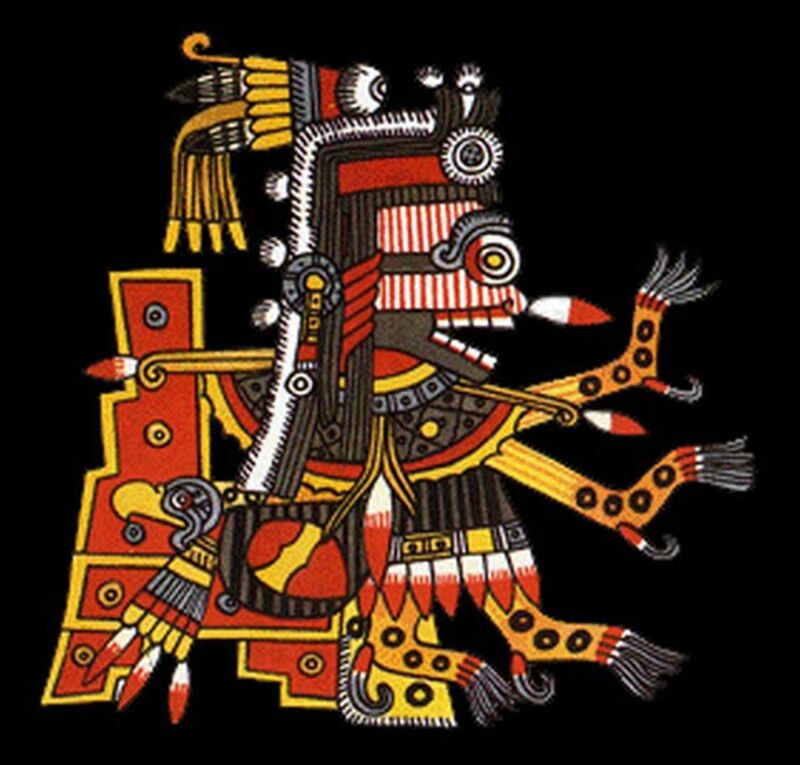 Not only was Itzpapalotl considered one of the cihuateteo herself, but she was also one of the tzitzimime, star demons that threatened to devour people during solar eclipses. As the legend goes, Itzpapalotl fell from heaven along with Tzitzimime and several other shapes such as scorpions and toads. Itzpapalotl wore an invisible cloak so that no one could see her. At some times, she was said to have dressed up like a lady of the Mexican Court, caking her face with white powder and lining her cheeks with strips of rubber. Her fingers tapered into the claws of a jaguar, and her toes into eagle’s claws. According to the Manuscript of 1558, section VII, Itzpapalotl was one of two divine 2-headed doe-deers (the other one being Chimalman) who temporarily transformed themselves into women in order to seduce men. Itzpapalotl approached the two “cloud serpents named Xiuhnel and Mimich”, who transformed themselves into men (so as to disguise themselves when all the others of the Centzonmimixcoa had been slain in the ambush?). To Xiuhnel, Itzpapalotl said “”Drink, Xiuhnel.” Xiuhnel drank the blood (menstrual?) and then immediately lay down with her. Suddenly she … devoured him, tore open his breast. … Then Mimich … ran and … descended into a thorny barrel cactus, fell into it, and the woman fell down after him.